Collard greens are loose-leafed vegetables cultivated for their large, edible leaves that are highly nutritious. They belong to the Brassica family, the same family as kale, cauliflower, broccoli, and cabbage, and often confused as kale. They feature dark, and thick leaves which are slightly bitter, with hard stems. They are impervious to frost and are tastier and more nutritious in the cold months. They are also sometimes called the tree cabbage or non-heading cabbage. Collards are cool-seasonal vegetable. They are best harvested in cold climates since mild frost can bring out the sweet flavor of this vegetable. Collard greens are a nutrient powerhouse, with excellent levels of vitamins and minerals. Collards contain vitamin A, rich in B vitamins, particularly niacin (B3), pyridoxine (B6) and riboflavin (B2), which are essential for overall body health. They also contain high levels of vitamin C and K.
The leaves are also packed with folate which is an essential nutrient for DNA synthesis. Additionally, collards are also rich sources of calcium, magnesium, and phytonutrents such as lutein and lipoic acid. 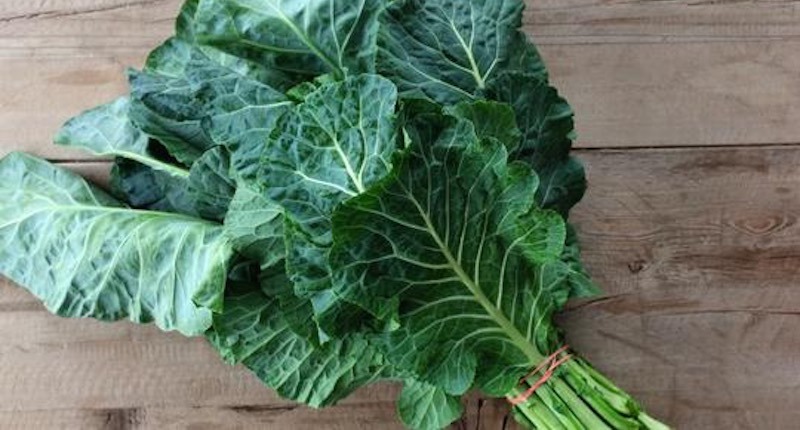 The high levels of vitamins and minerals found in collard greens make this plant a really great staple vegetable. Collards are among the most nutritious leafy vegetables that help prevent and fight many diseases. Bone Health: Collards is great for bone health, repair and development. People who are faced with bone problem, such as osteoporosis, will find this vegetable a great help. Blood Building: The high content of chlorophyll in collards helps to improve the hemoglobin level in one’s body. The chlorophyll molecules are closest to human’s hemoglobin molecules, making it one of the best juices for people who are anemic. They are blood building and encourages smooth blood circulation, preventing blood stagnancy and inflammation. Cancer: This green vegetable contains high levels of antioxidant that fight free radicals. Free radicals are harmful elements that damage skin cells. They are the main culprits of cancer development and skin disorders initiation. Having high levels of antioxidant in the body helps lower risks of cancer. Cholesterol: Certain nutrients found in collards are important for lowering blood cholesterol levels. These include vitamin A and C, folate, and its fiber. Dementia: The high level of folate found in collards is essential for lowering homocysteine level. People who have high levels of homocysteine are found to be at risk of heart attack, stroke, and Alzheimer’s disease. Heart Disease: Collard greens is helpful for heart health. Its antioxidant properties and vitamin content are essential for stabilizing heart rate. Immune System: The vitamin C that is present in collards is great for strengthening immune system. With sufficient vitamin C, your body will be able to fight different kinds of disease. Skin Health: Collards are excellent source of calcium, vitamins A, C, K and phytonutrients, all representing requisite nutrients for good skin health. They are also one of the richest sources of lutein, and contains beta-carotene, both improve our skin’s elasticity, firmness and keep it healthy. Vision Health: Collard greens contain a high concentration amount of carotenoids (zeaxathin and lutein). Both these ingredients are necessary for protecting our eyes against ultraviolet lights. Due to the high levels of these anti-oxidants, they are helpful in defending the retina against free radicals. Weight Loss: Collards contain a dietary fiber, an important nutrient for weight loss and maintenance. The nutrients and chlorophyll in collards are excellent properties that help improve metabolism and aid weight loss. 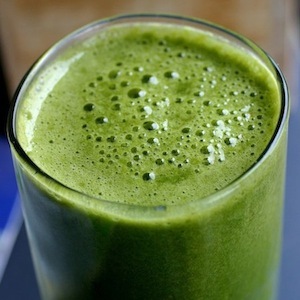 Including collards in your daily juice helps melt the fats away! Choose collards with leaves that have firm and smooth texture. Smaller and younger leaves usually are less bitter and have a more tender feel. Fresh leaves can be stored up to 3 days in domestic refrigerators, and up to 10 days in high-end freezers. Collard greens can be eaten fresh or cooked. If you prefer to eat them cooked, it is important to only cook them with small amount of water, better if you just steam them, to preserve the nutrients they contain. Overcooking will eliminate most of the vitamins and minerals in the leaves, making your dish no longer healthy. Recommended juice using collards: 1 carrot, 2 green apples, 2 leaves of collards, ¼ lemon and 1-inch ginger makes an awesome-tasty green juice! Like all good things, eat/juice collard greens in moderate quantity. Despite the health benefits they bring, too much may also cause harm to the body, such as swelling of thyroid glands. Do not drink of its juice more than three times a week.